Universal Health Coverage Day, commemorated each year on 12 December, is the anniversary of the first unanimous United Nations resolution calling for countries to provide affordable, quality health care to every person, everywhere. This resolution on Universal Health Care was passed in December 2012. Universal Health Coverage (UHC) is an important means to promote the human right to health. UHC has been included in the Sustainable Development Goals adopted by the United Nations. It means everyone can access the quality health services they need without financial hardship. 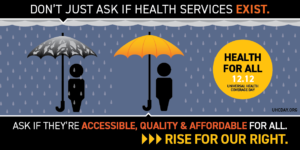 All people, including the poorest and most vulnerable, should be able to access a full range of essential health services, including prevention, treatment, hospital care and pain control. The way this can be achieved is when costs are shared among the entire population, e.g., through an affordable health insurance scheme. According to the WHO, more than 100 low- and middle-income countries have taken steps to deliver UHC. These countries represent three quarters of the world’s population.